Unlike most Hindi biopics, Soorma doesn’t unnecessarily romanticise poverty, racism, tough parents or broken families as major struggles in hockey champ Sandeep Singh’s fight to be our national hero. Instead, it internalises these issues by looking at his story from a romantic lens, the angle of love. Plus, an inexplicable tragedy that strikes when least expected. Though it’s not always relative, the film looks fresh in this new perspective when compared to most Hindi biopics. It’s an interesting comment on how love can make you push boundaries and achieve the unthinkable, while at the same time, it can also mar your progress making you complacent. Sandeep Singh (Diljit Dosanj), a natural at one of the most difficult hockey strokes (Drag Flick) takes to the sport so that he can win the girl he loves, a fellow hockey player. He is so blindly in love that it doesn’t let him see his misery or his family’s struggles. There is a brilliant scene where his brother Bikram (Angad Bedi) tries to knock some sense into his head. 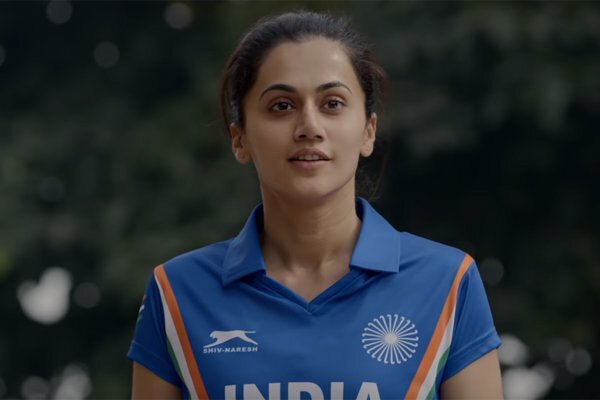 The first half is an easy-breezy watch with some crackling chemistry between Diljit and Tapsee Pannu (playing Preeto, the aforementioned girl) and how he makes it to the Indian team. But Soorma takes a turn when Sandeep is shot in the train that not only paralyses him but also affects his relationship with Preeto. Overall, Soorma has been written and directed well. Some of the dialogues are very clever. For instance, the scene where Sandeep looks at Preeto with wide eyes and mouth agape as she points out, “Mooh band kar lo, laar tapak rahi hain, paudha ugg ayega.” Similarly, when Satish Kaushik (our very own Calendar from Mr India) makes a clever Mogambo reference, you cannot help but smile. The film looks gorgeous and has been shot well by Chirantan Das, beautifully capturing the essence of the rural Punjab setting. Some of the frames are wonderful. For instance, the scene where Sandeep and his brother are about to board the train is shot from the train, and you realise it only when the train starts moving. The old dressing table, the landline phone perched on a Croatia-knitted mat, the charpoy on the terraces… Sharmishta Roy has, as always, done a fabulous job on the production design. It also packs in some powerful performances with Diljit Dosanjh leading the way. The film belongs to him. There is an inbuilt simplicity in Diljit that’s quintessential for a character like Sandeep which translates effortlessly on the screen. Sandeep is cocky, humble, simple, angry, helpless and in love, and Diljit nails every emotion with earnestness. It’s also a delight to watch Angad Bedi as Sandeep’s rock solid support. Satish Kaushik shows once again what a fine actor he is. The way he looks shell shocked, delirious and cluelessly helpless at the hospital made me cry a river. Tapsee Pannu also manages a decent performance. However, Soorma isn’t without flaws. It gets manipulative in places. The happy banter before the gunshot scene is written to establish Sandeep as a happy-go-lucky character and ooze out more sympathy for him. The song montages against a gruelling training session is also not too original. Hindi films will have to come up with better narratives to depict grit and determination in our sports heroes! Shaad Ali finally redeems himself after the disastrous Kill (Me Gently) Dill by bringing Sandeep Singh on celluloid and sharing his inspiring story. Watch it over the weekend.